Are viewers still in love with the Pearson family? 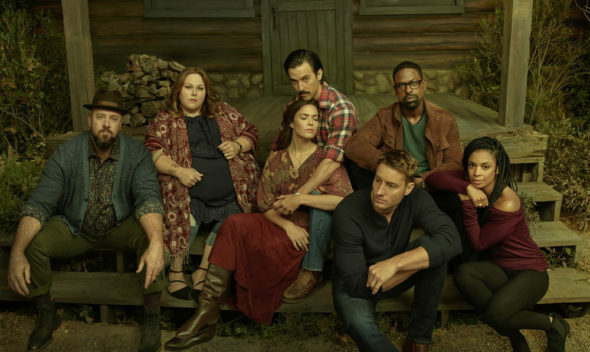 Has the This Is Us TV show been cancelled or renewed for a fourth season on NBC? The television vulture is watching all the latest cancellation and renewal news, so this page is the place to track the status of This Is Us season four. Bookmark it, or subscribe for the latest updates. Remember, the television vulture is watching your shows. Are you? Airing on the NBC television network, This Is Us stars Milo Ventimiglia, Mandy Moore, Sterling K. Brown, Chrissy Metz, Justin Hartley, Susan Kelechi Watson with Chris Sullivan, Jon Huertas, Niles Fitch, Logan Shroyer, Hannah Zeile, Mackenzie Hancsicsak, Parker Bates, Eris Baker, Faithe Herman, Lonnie Chavis, Melanie Liburd, and Lyric Ross. The series follows the Pearson family across the decades — from young parents Jack (Ventimiglia) and Rebecca (Moore) in the 1980s to their adult kids Kevin (Hartley), Kate (Metz) and Randall (Brown) as they search for love and fulfillment in the present day. The third season of This Is Us averaged a 2.02 rating in the 18-49 demographic and 8.32 million viewers. Compared to season two, that’s down by 34% and 25%, respectively. Find out how This Is Us stacks up against other NBC TV shows. As of April 23, 2019, This Is Us has not been cancelled or renewed for a fourth season. Stay tuned for further updates. This series continues to be a top-rated show for NBC so I’m sure This Is Us will be renewed for a fourth season. I’ll update this page with breaking developments. Subscribe for This Is Us cancellation or renewal alerts. Find more This Is Us TV series news or other NBC TV show news. What do you think? Do you hope the This Is Us will be renewed for a fourth season? How would you feel if NBC cancelled this TV show, instead? It’s the best…pleeeeease don’t cancel. Surely they’re not even thinking about canceling! I love this show! There’s not many good shows to watch on TV and this is truely a good one! They have done an excellent job going through all the different seasons of peoples lives and all the connections with extended family! Please I pray they don’t take it off !! I would definitely be disappointed if the series was cancelled. Besides great acting, this series brings the Pearson family to life portraying real life. They are heart-warming and real. I really have enjoyed this series…am in Germany and able to follow, after paying, on Amazon. I do hope it will continue. Excellent continuum, fine acting, marvelous writing, moving and emotional and realistic episodes. Thanks for the terrific series! Hope it will be renewed.